Our Law Firm Has Over 40 Years of Experience Handling Personal Injury and Wrongful Death Truck Accident Cases – Experience You Can Trust! If you had any accident resulting in injury from a fork lift, lift truck or other truck, please contact our fork lift injury lawyers now for your absolutely FREE and confidential case evaluation and FREE and confidential case consultation. Fork lifts are trucks that are used by many industries and businesses to move and lift heavy and large materials, containers and other objects. OSHA is the Occupational Safety & Health Administration operated out of the United States Department of Labor. OSHA was created out of the Occupational Safety and Health Administration Act of 1970. Its key purpose was and is to assure safe and healthy working conditions for all workers, both men and women, by identifying, setting and enforcing workplace standards and also by providing certain training, education and assistance. OSHA covers most private business workers and employees in all 50 states and also in some of our territories (like the District of Columbia, Guam, Puerto Rico and the Virgin Islands), as well as some public (government) employers. This is the official OSHA warning notice to all employers and their workers that no one under 18 years of age may legally operate a fork lift or lift truck. Many states have their own OSHA State Plans. It is required that such State Plans have workplace safety and health standards that are “at least as effective” as federal OSHA standards. In fact, many State Plans adopt standards that are identical to federal OSHA standards. Such State Plans must also cover state and local government (public sector) workers. California has its own Cal/OSHA State Plan – Title 8 Regulations, which may be found and reviewed by clicking here. OSHA even offers small and medium size employers and businesses a free, voluntary and confidential safety and occupational health on-site inspection service to help such employers create or improve their injury and illness prevention programs by finding, identifying and correcting hazards. To learn more about this voluntary and free on-site inspection service, please click here: OSHA on-site consultation service or call 800.321.OSHA (6742). It is important for employers to remember that this OSHA on-site inspection service is completely separate from its enforcement duties and does NOT result in any penalties or citations. It is simply to provide advice on OSHA regulations and standards and how to comply with same, including assisting with setting-up and operating illness and injury prevention programs. Note: Regarding OSHA and fork lifts: It is a violation of Federal law for anyone UNDER 18 years of age ever to operate a forklift, lift truck or other similar truck regardless of what it is called or for anyone OVER 18 years of age who is not properly trained and certified to ever operate a fork lift or other similar truck. 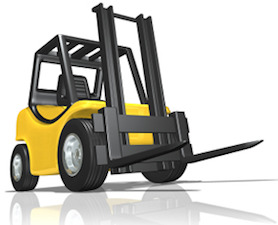 Also, if you suffered any injury due to a fork lift, lift truck or other industrial truck in Los Angeles, the San Fernando Valley, San Bernardino, Kern, Riverside or anywhere in California and would like to seek monetary compensation for your injuries and damages, there are many simple ways to contact us for your absolutely FREE and confidential case evaluation and consultation. If you had a fork lift accident, our personal injury & wrongful death accident lawyers offer an absolutely FREE & CONFIDENTIAL case consultation and evaluation and we work on a contingency fee. That means there is NO fee until you WIN and then the fee comes out of the recovery usually paid by the other parties’ insurance company and not out of your own pocket. Simply click here for our quick and easy contact form to tell us about your lift truck accident or other injury accident.